Welcome to my slice of life where God is sought. . . and found. . . a place filled with beauty, wisdom and music. . . and the possibility of healing our everyday human suffering. We are all created in the image of God. This means that the flow of constant movement is an essential part of our nature. If I can share even a glimmer of the beauty and healing power of Kabbalah – that is, God's love for us all – then my flow is fruitful. 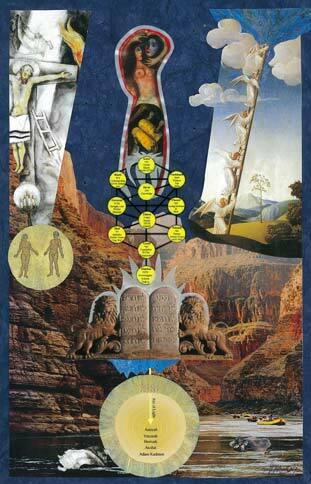 "Kabbalah" means receiving the Divine gifts of life that are everywhere, in all things. The teachings help us to experience the holiness of each moment, each human encounter. Kabbalah explains the structures and movement of life, the particles and waves of existence that result from the vessels and light of Kabbalah's Tree of Life. I invite you into these ancient/modern teachings founded in mystical Judaism. The beauty and wisdom of this path to God continues to live and grow through the generations of sages and people like you and me, who love God and long for wholeness. If you are interested in learning more about Kabbalah, I offer classes in person and on line at Kabbalah Teachings – and check out my teaching blog at Online Conversation. a way to align the abundance of light present within all Creation with the darkness that is also here. help for whatever in your life needs support, perspective, healing, blessing. a unique blend of spiritual counseling and healing. These sessions draw upon both the spiral wisdom of the Pathwork Lectures and the healing reservoirs of Divine grace found in Kabbalah's Tree of Life. "He wished to create worlds and cause emanations....to bring into being His perfect works, names and attributes....this was the reason for the Creation." All material copyright © Iris Markham.